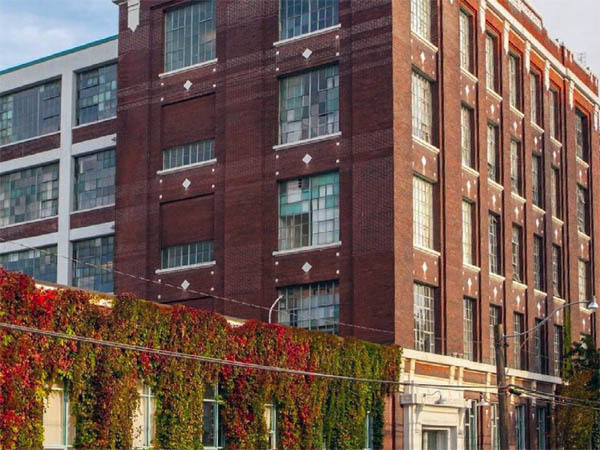 The Robert Watson Lofts are converted from an old confectionary factory just north of Parkdale. 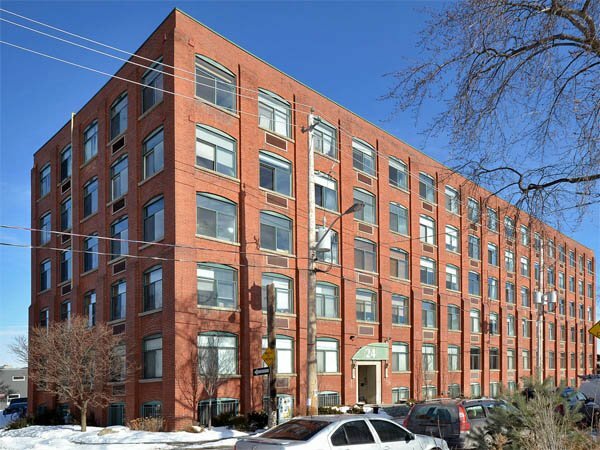 The Robert Watson Lofts are considered by many, myself included, to be one of the best loft conversions in Toronto. 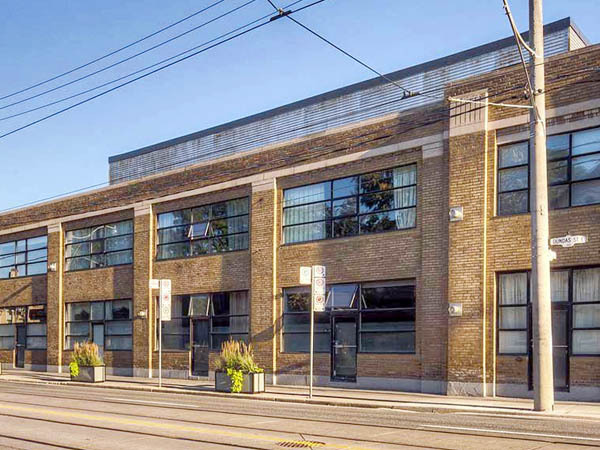 As the original home of the R & T Watson Co. confectioners, the address 363 Sorauren Avenue has been one of the sweetest in Toronto. 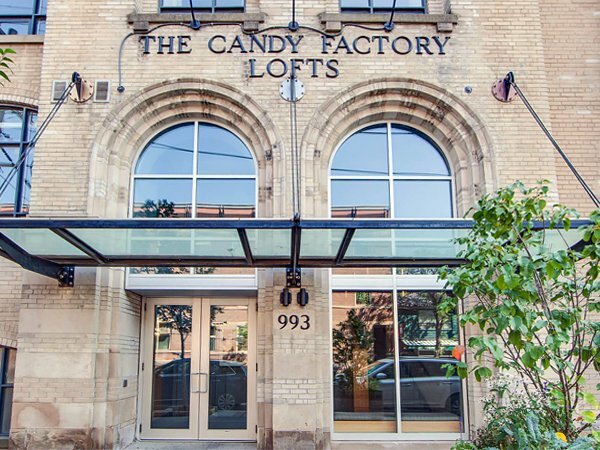 This historic landmark was transformed from sweet to suite in 2007 by Rosebud Homes and Sky Development Group, and now the former candy factory is full of fabulous lofts. 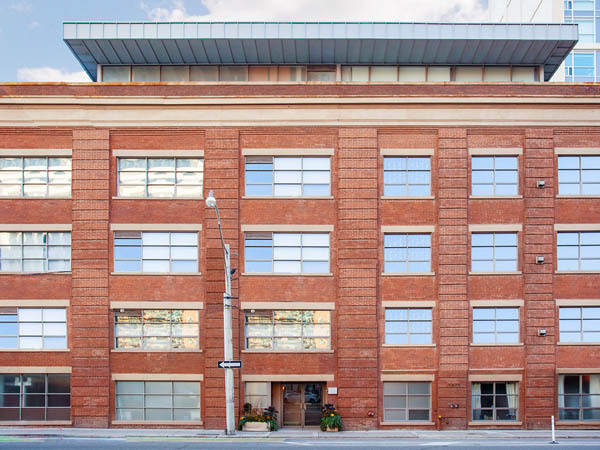 The vintage building making up half of the loft conversion fronts on to Sorauren Avenue. 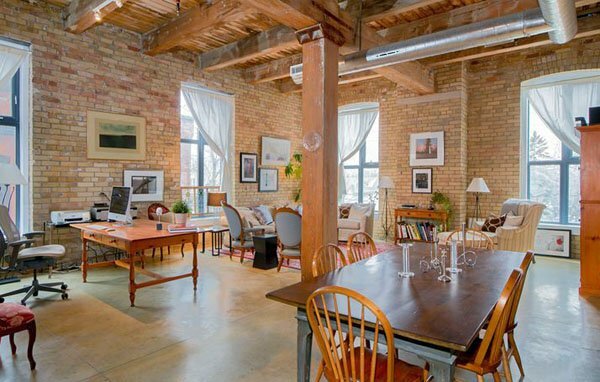 It is the century-old Robert Watson warehouse (built in 1907) that was been restored and converted into vintage lofts. 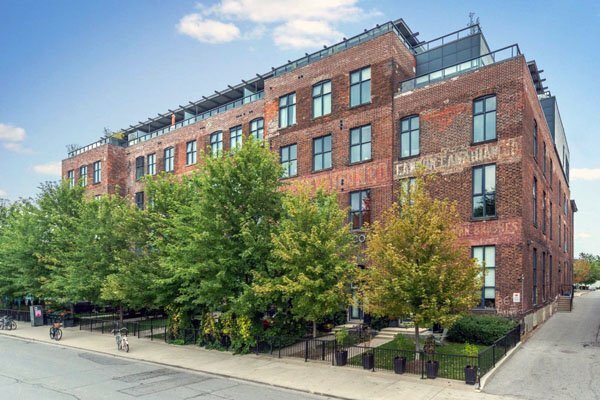 With exposed century-old brick, wood ceilings, wood and steel columns, and 10 to 16-foot ceilings, the project stands out as one of Toronto’s finest loft conversions ever. 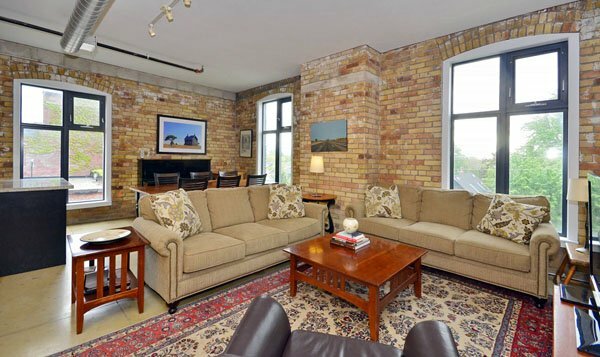 It is loaded with spectacular luxury finishes including granite and stainless steel appliances. 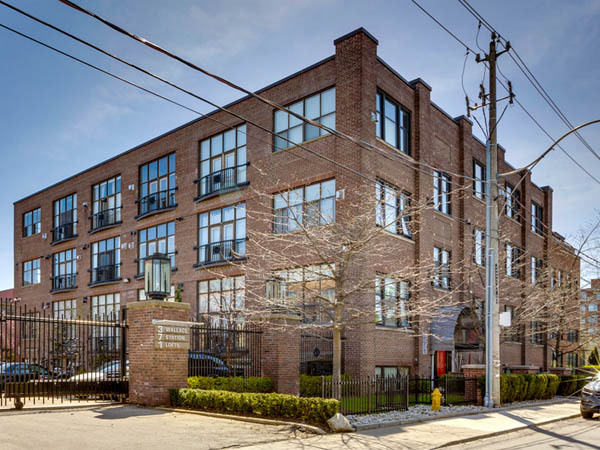 The new loft building behind is a six-storey soft loft with high ceilings, polished concrete floors, concrete columns and expansive glass with spectacular views. 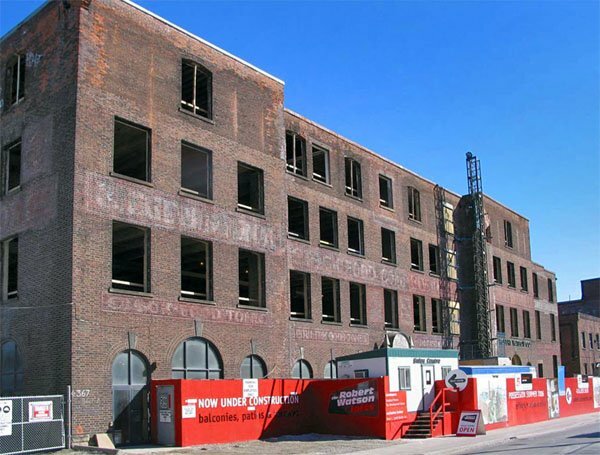 The original Robert Watson confection factory was converted in 2007, while at the same time a soft loft extension was added behind the main building, where a smaller building had been torn down. 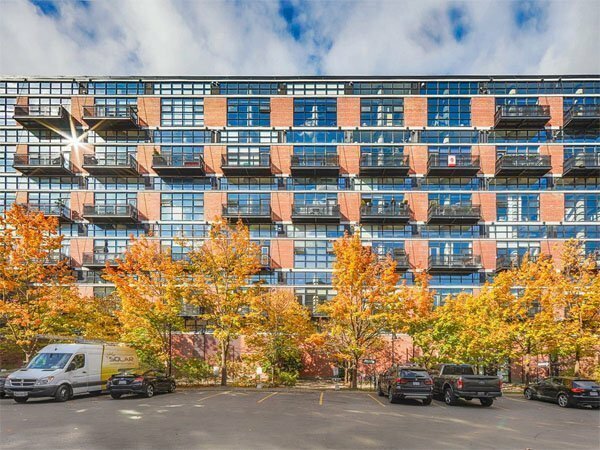 The result is 153 one and two level units that range in size from 550 to over 1,500 square feet. My favourite unit is the one on the ground floor at the back of the original building, carved out of the old boiler room. The remains of the old smoke stack poke up from the top of this unit. And you can still see the large round holes (now bricked up) where the huge pipes went through the walls. 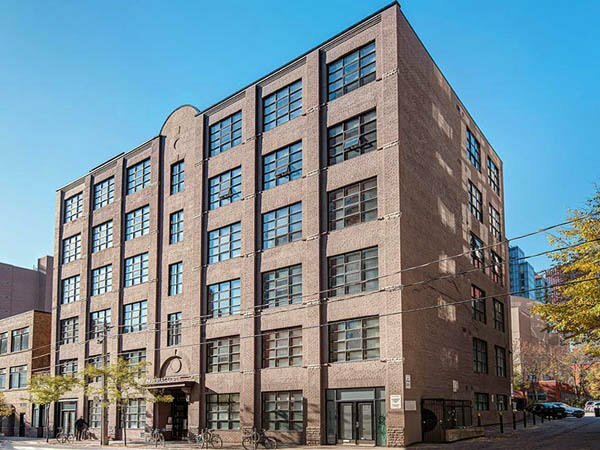 There’s plenty of character in all of the lofts at Robert Watson, with exposed brick walls, beautiful floor to ceiling windows, high ceilings with original wood beams and polished concrete floors. 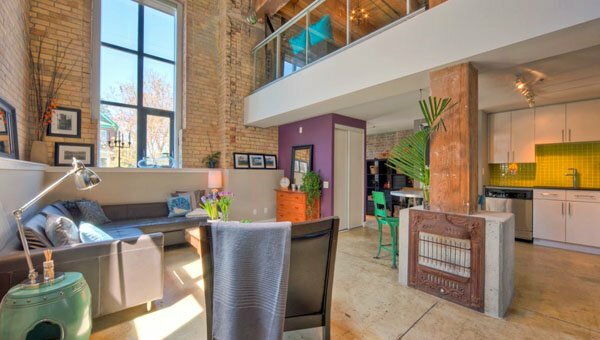 Some units also feature private terraces, and suites with arched windows in the hard lofts are some of the coolest you’ll see. 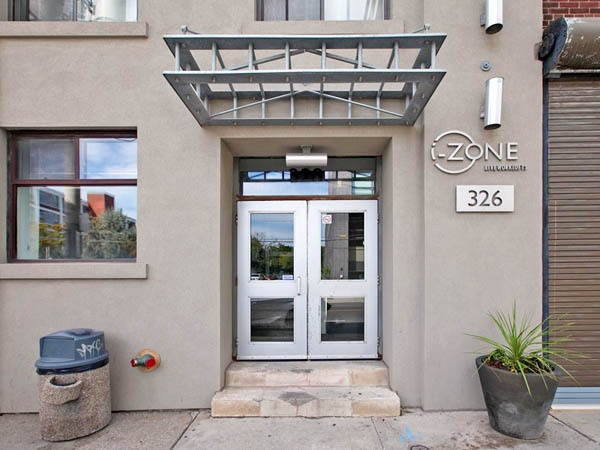 Limited amenities include an excellent fitness centre and a multipurpose/party room, but keep the fees reasonable. You want brick and wood? 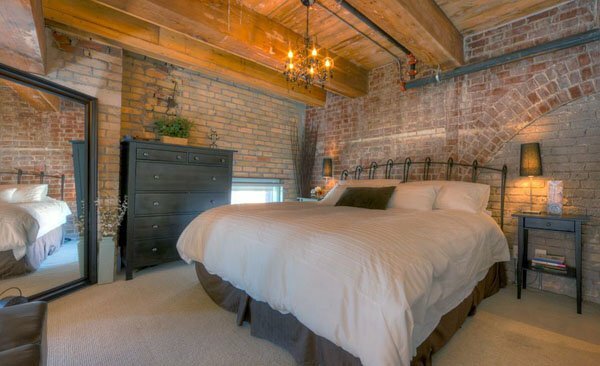 Robert Watson Lofts have brick and wood. Respecting the heritage of the building, Rosebud and Sky Development went to great lengths to preserve the vintage building’s character by leaving the original painted lettering on the exterior, as well as the century-old brick and wood inside the lofts. 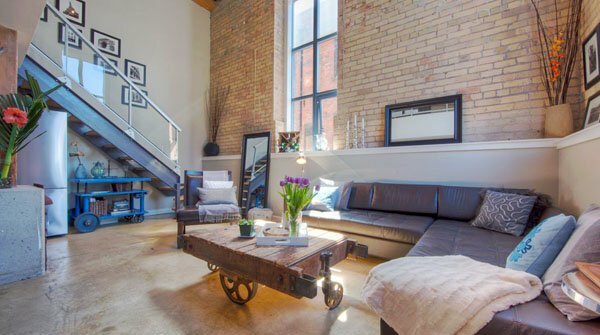 The remains of the 1907 industrial aesthetic give the Robert Watson Lofts their authentic conversion charm. 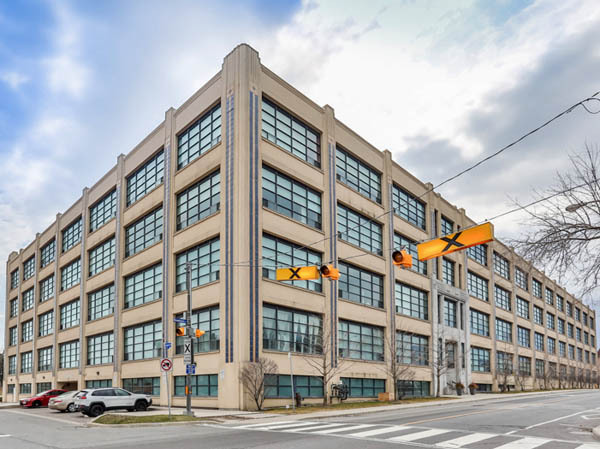 Both buildings include high ceilings and polished concrete floors. 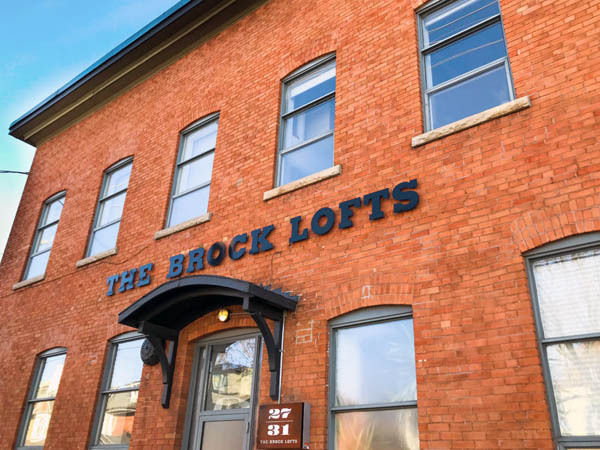 The new loft building will also feature expansive walls of windows offering stunning city views, gas ovens for cooking, and patios or balconies. The fusion of the new and vintage buildings is spectacular. 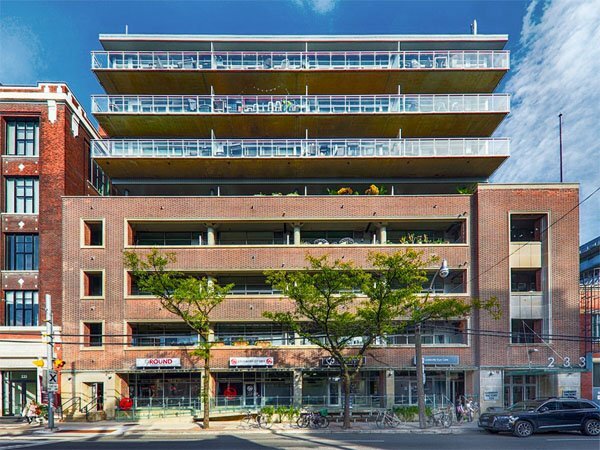 The conversion project received Honourable Mention for the 2011 Toronto Urban Design Awards and the 2011 Heritage Toronto Award. Robert Watson born in County Down, Ireland, in 1850 and his brother in 1852. They came to Canada in 1867 and settled in Toronto. That same year, he started working for a confectionery established by a Mr. Robertson, staying at that job for 7 years. In that vein, I found an interesting wedding notice from November 1873. William George McDermott – a confectioner – married Charlotte Cuff with Robert Watson as a witness. I bet they worked together. And this was one year before he left that company to start his own business. After learning all he could about the candy business, at 24 years of age, he started his own company with his brother. 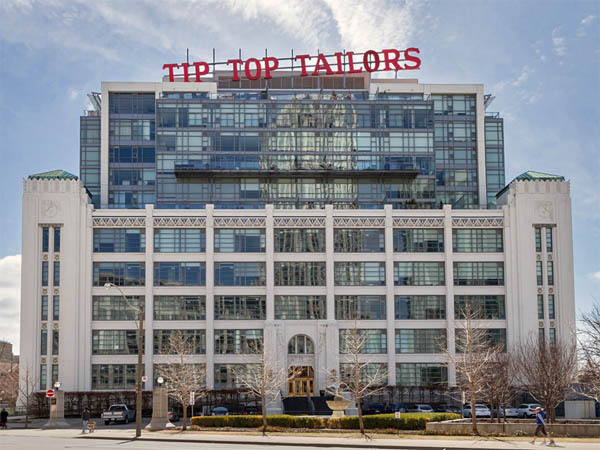 They began at 357 Yonge Street, a much different neighbourhood than today. Then to 65 Jarvis and finally settling at 75 Front Street East where they really started to grow the business. Unfortunately that part of the gorgeous southern block of Front Street west of St. Lawrence Market was torn down long ago. 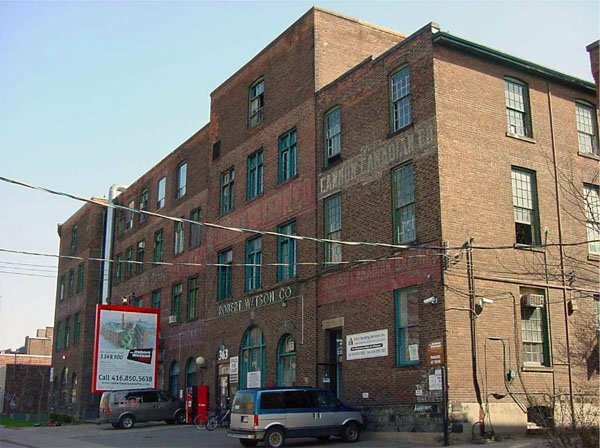 And the loss of that building is a real shame, as E. J. Lennox designed their factory on Front Street in 1888. 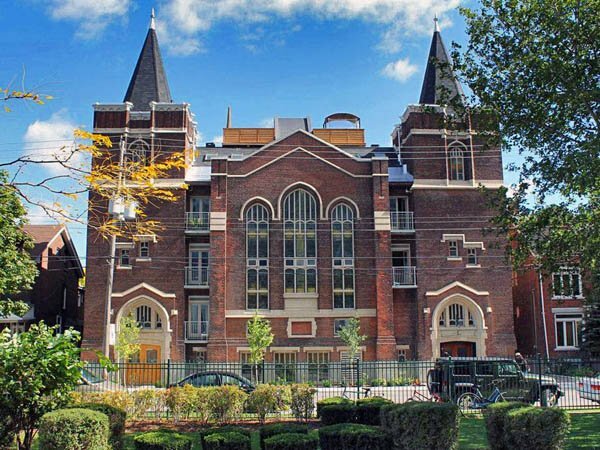 One of early Toronto’s best loved architects, it is really too bad his building is long gone. 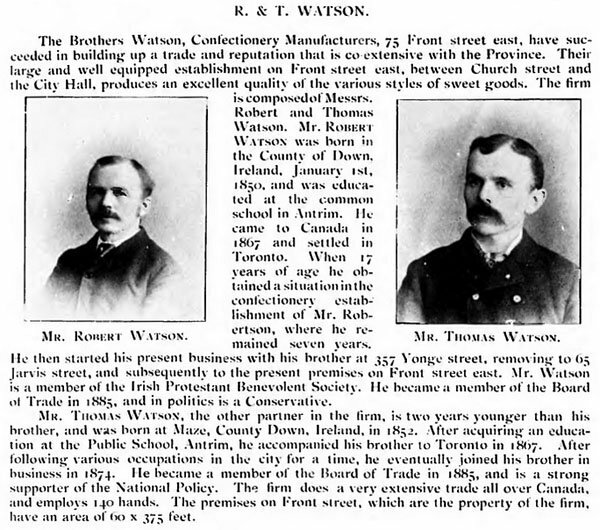 He also built Robert Watson a house on Shuter near Jarvis in 1893. Probably near their previous facility at 65 Jarvis. And then he built Robert Watson’s new house at 234 St. George in 1902. 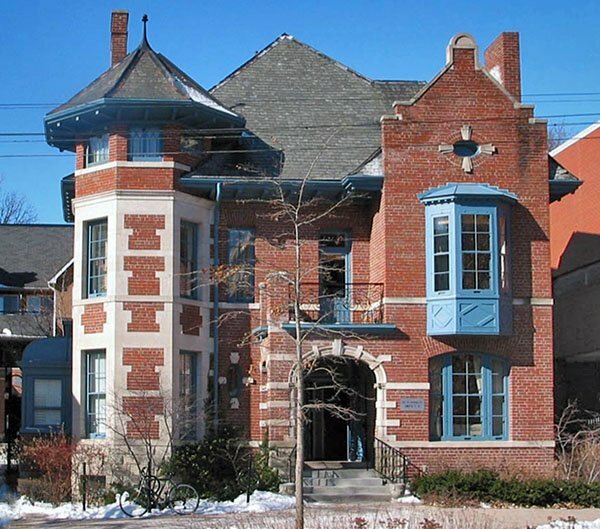 Robert Watson’s house at 234 St. George Street, built in 1902, the second home he had designed by famed Toronto architect E. J. Lennox. 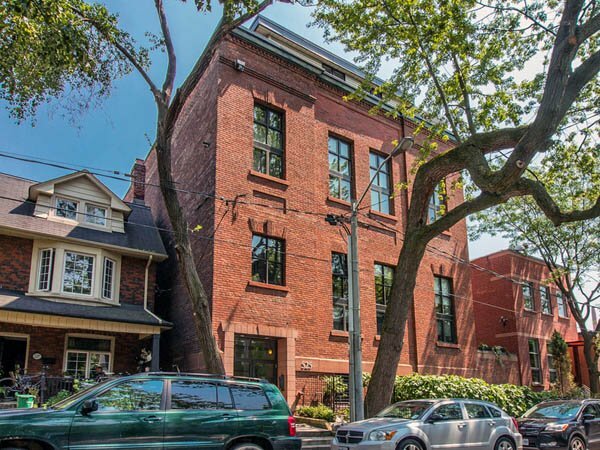 This house is part of the Lennox Mews loft/townhouse complex, making Robert Watson the only person in Toronto history to have both their home and place of business converted to lofts! 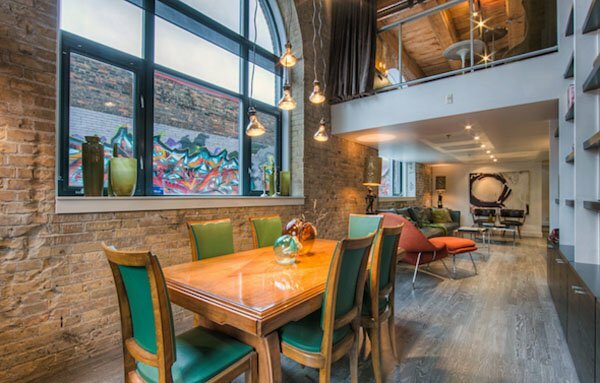 NB: One of the best pieces of Toronto loft trivia. 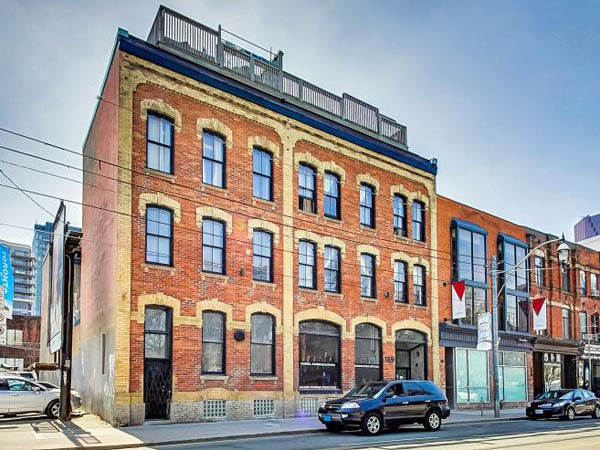 Robert Watson is the only historic Toronto figure to have both his home and his place of business converted to lofts. 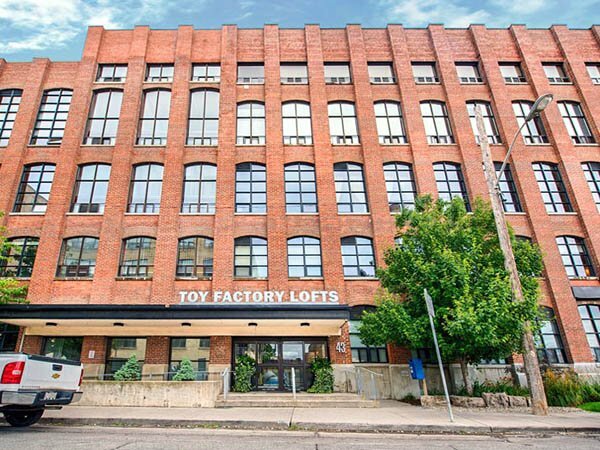 His factory has become the Robert Watson Lofts and his home is now the Lennox Mews Lofts. 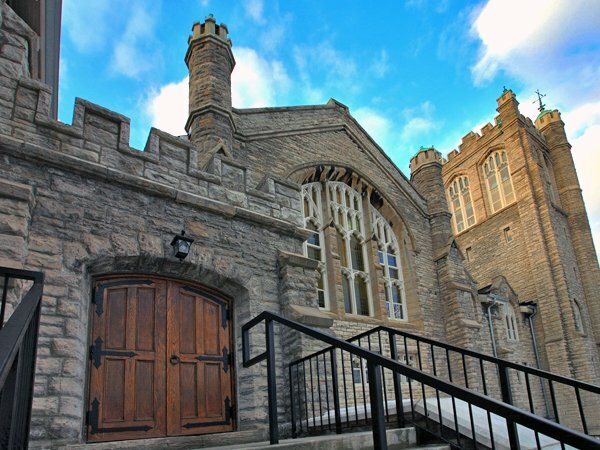 The second home of the Watson family confectionery, 65 Jarvis Street, was built in 1869 and still stands. It was and is known as the John Smith and Company Warehouse. 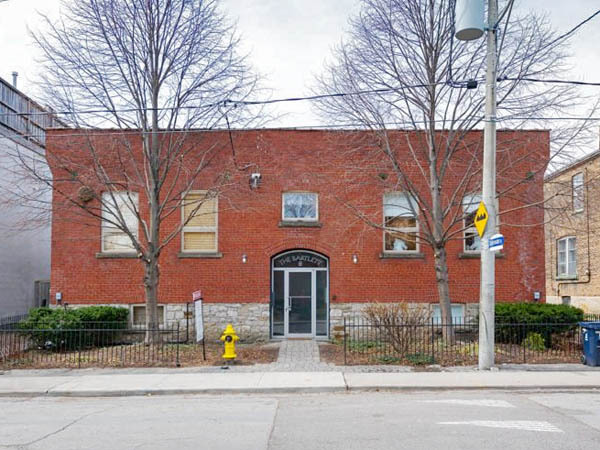 It is a rare surviving example of a late 19th century warehouse in Toronto that displays decorative detailing from the Gothic Revival style. You can read more about it here. Unfortunately, there doesn’t seem to be any information on the architect. 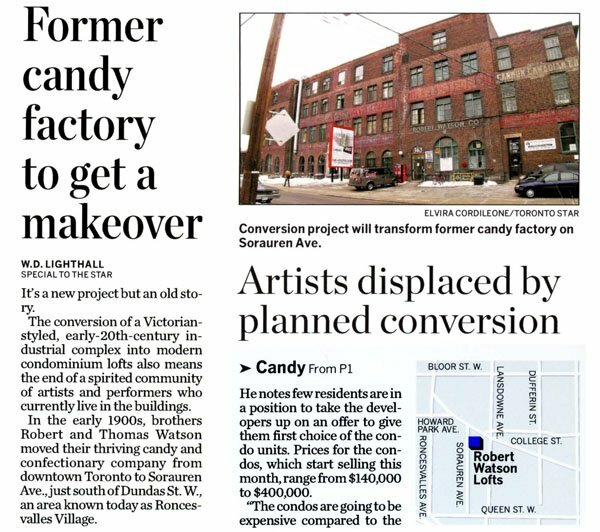 Nor, for that matter, is there any information on the architect who built the factory building on Sorauren. 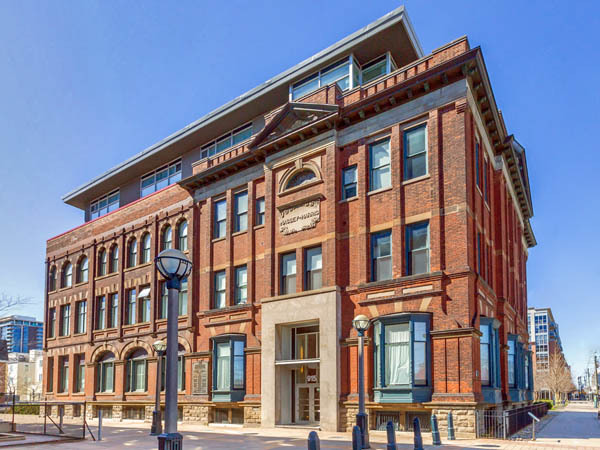 With Lennox having designed 3 buildings for Watson, one is tempted to think it was he, but the Sorauren building just does not have his “style”. This is the only historical photo I can find of the old Robert Watson factory. You can see its smokestack at left, on the other side of the Dundas West Bridge. In this 1936 photo, you can also see the Matthews Brothers picture frame factory across the bridge to north, at right. 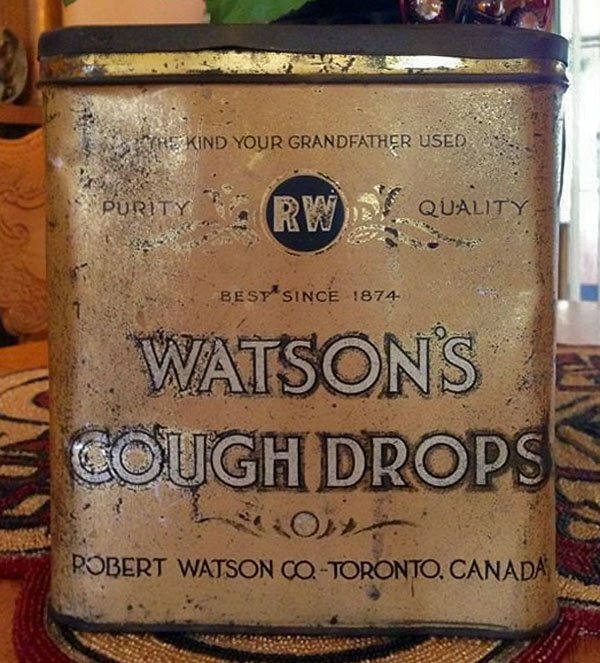 Originally the R. & T. Watson Co. was known for cough drops. Their main product was “Watson’s Imperial” cough drops. They sued a competitor in 1887 (with J. M. Ridout acting as their lawyer, a relative of the John Ridout that Samuel Jarvis famously killed in a duel) over the name. The other company was selling Imperial Cough Candy, one can see what the problem was. 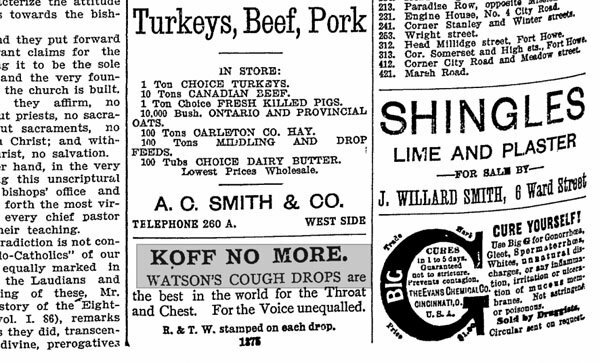 They also made “Watson’s Cough Drops”, as seen in a text ad in the January 2nd 1892 edition of the GRIP. 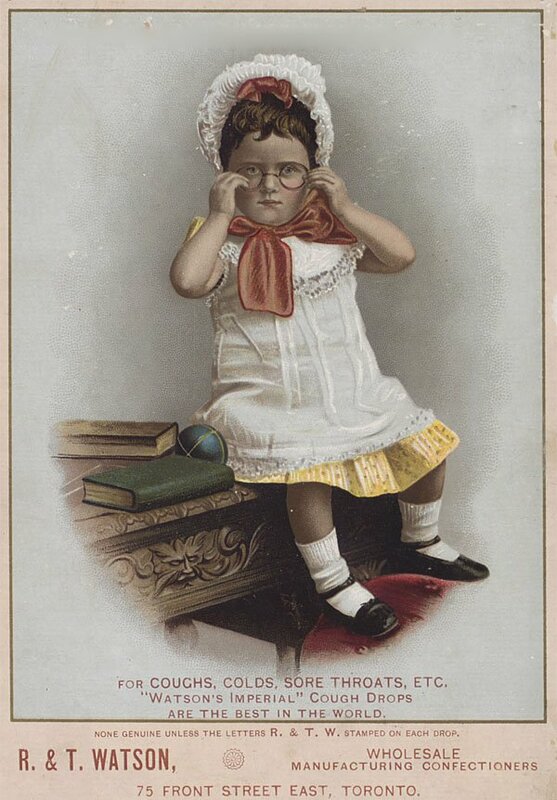 They were even advertising as far away as New Brunswick by 1896, illustrating the reach of their products at the time. Their slogan was “Koff No More” and they marketed them towards smokers who had sore throats! The tins the cough drops came in were apparently manufactured by a company called Macdonald, but I am not sure who that is. The tins are rare these days and seem to be quite collectible. You can find them on eBay and Etsy and other antique and collectibles sites. History does indicate that cough drops were the biggest item in their inventory, not candy so much. At least not in the beginning. There isn’t a lot of information about the company in the 1900s. The factory was built in 1907 and there were additions made in the 1920s. At some point they switched from cough drops to mints. They were bought by the British candy company Trebor in 1975. At that point they were known for their peppermints, sugar-coated Scotch mints and coloured after-dinner mints. 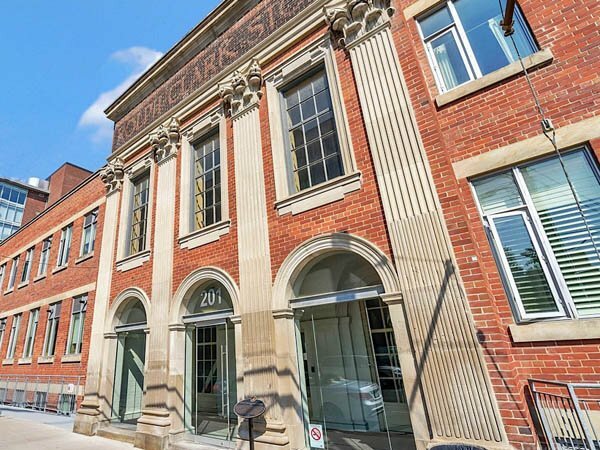 I wonder if there was a connection to the large Nestle plant to the north, which used to be Cowan’s Cocoa and Chocolate factory back in the 1920s and 1930s? In 1989 Trebor was bought by Cadbury and all traces of the Watson boys faded away. What do they mean? 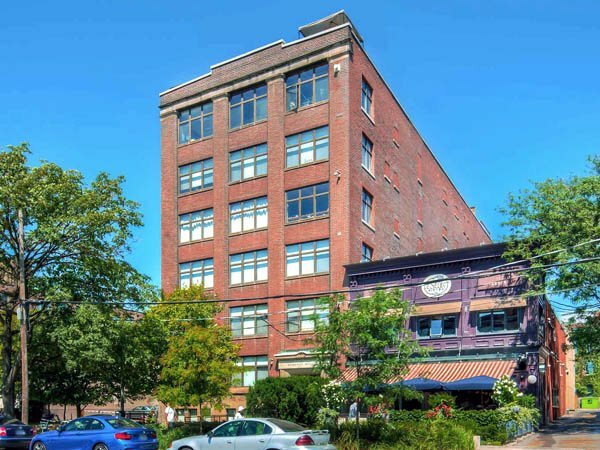 Did the Robert Watson Co. rent out space in the building to other companies? 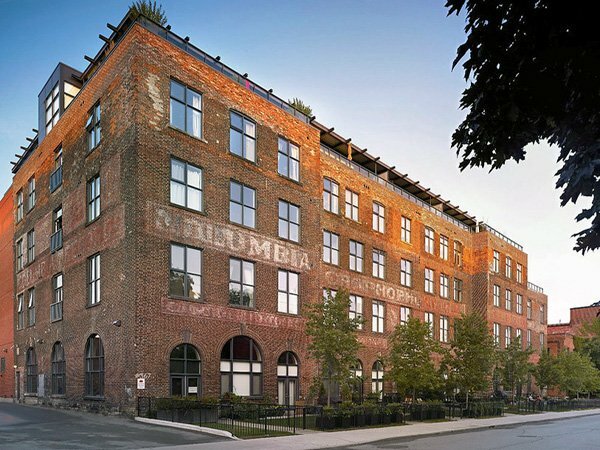 That was not unsual at the time, as noted in the history of the old Wellinger & Dunn Leather Sports Goods building, now the One Columbus Lofts. Or, did companies just buy ad space on the walls? I swear the “Columbia” one extends to read “Gramophone” on the next piece of wall. But it is all a mystery as far as I can tell. 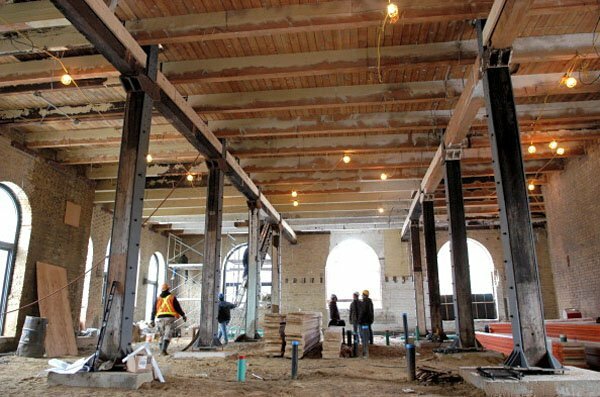 Part of an article from the Toronto Star in February of 2004 talking about the Robert Watson Lofts. The project was not completely finished until 2007. 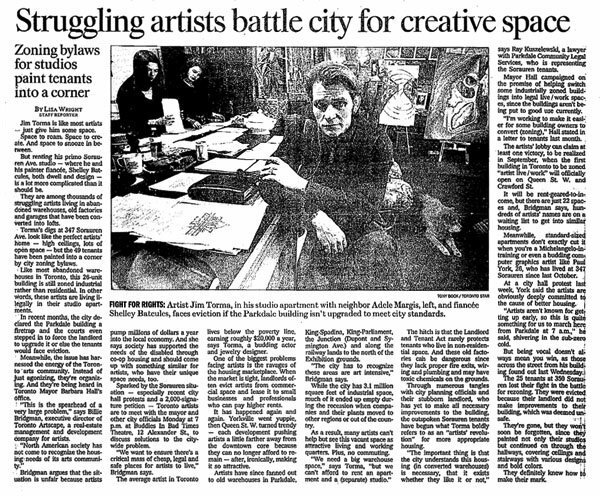 There was an article in the Toronto Star that picks up in 1995, talking about artists and their studios in old factories on Sorauren. There were fights with the city over zoning and derelict landlords letting the buildings go to pot. 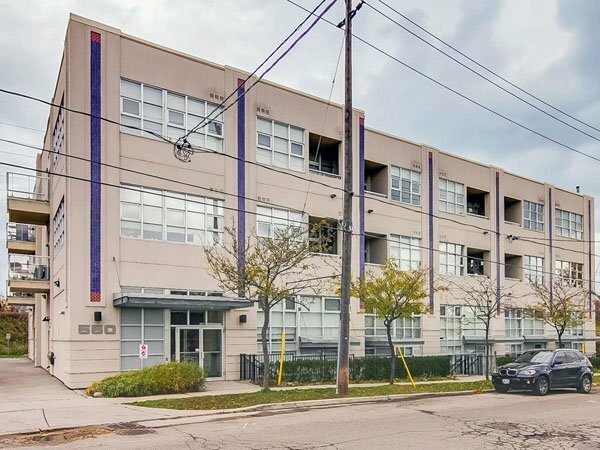 The article is mainly about 347 Sorauren, but it does mention the tenants of 350 Sorauren being evicted. The landlords of both buildings were not keeping them up to code, they were dangerous fire traps according to the city. 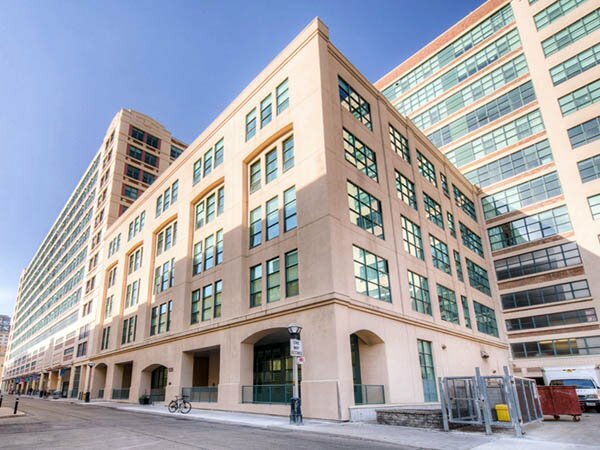 So 25 tenants at 350 Sorauren were evicted because of their bad landlord. I guess the building was bought cheap after that and converted. 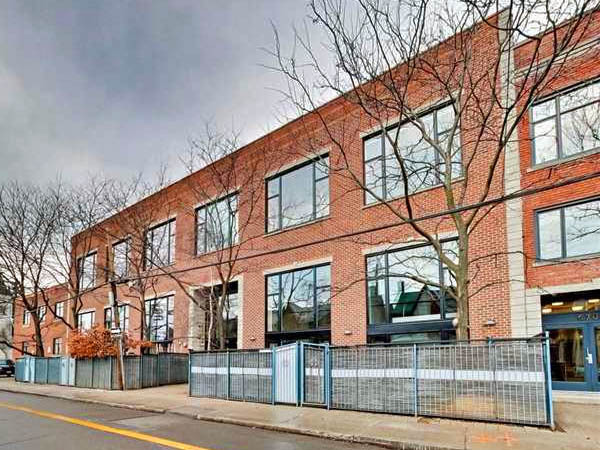 Same with 347 Sorauren, I assume those tenants also got turfed, which led to it being converted to lofts as well. 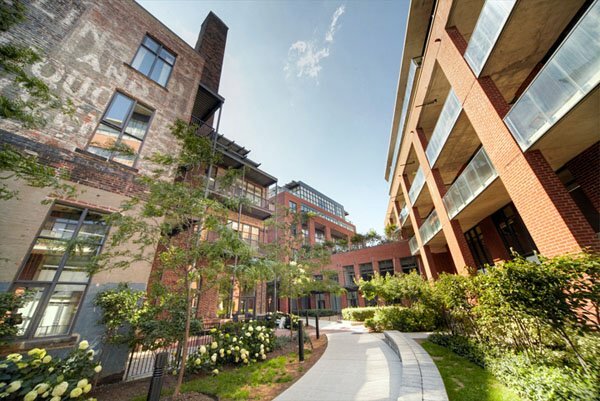 Part of the problem with the rental live-work spaces was that the buildings had never been officially zoned for residential use. They were not necessarily in the best shape and certainly were not up to building code. Technically, everyone was living there illegally, but booting them all out for profit still isn’t cool. 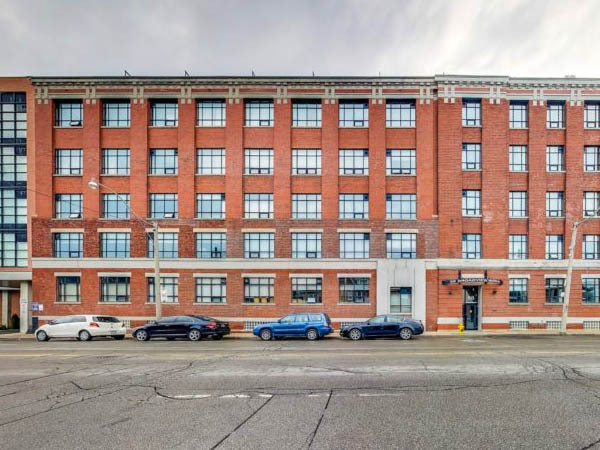 Sure, the tenants were given first choice of the lofts to buy, but few bought as most of them could not afford the prices. 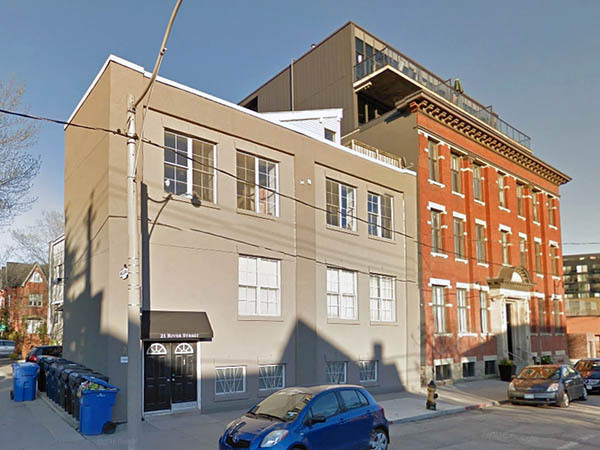 The residents of 363 Sorauren did not protest like the occupants of One Columbus did 10 years previously. Instead, they had yard sales and sold off lots of art and interesting found objects. You almost don’t want to know what they originally sold for. The prices started low, if I remember, my wife and I checked them out way back when. 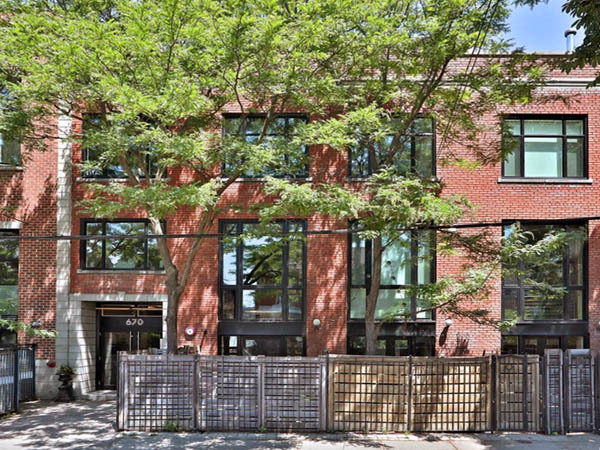 You could get a pretty big and awesome unit for around $249,000 I think. Small ones started as low as $149,900. But that was in the mid-2000s. 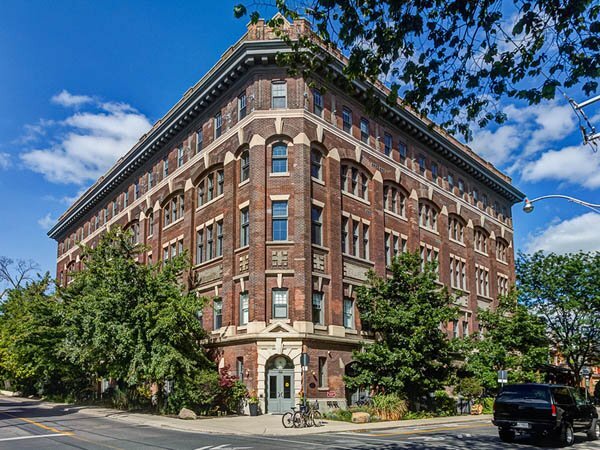 For a rather big building, units at the Robert Watson Lofts don’t come up all that often. When they do, you need to get in there quick! The most attractive feature of this building today is the location. 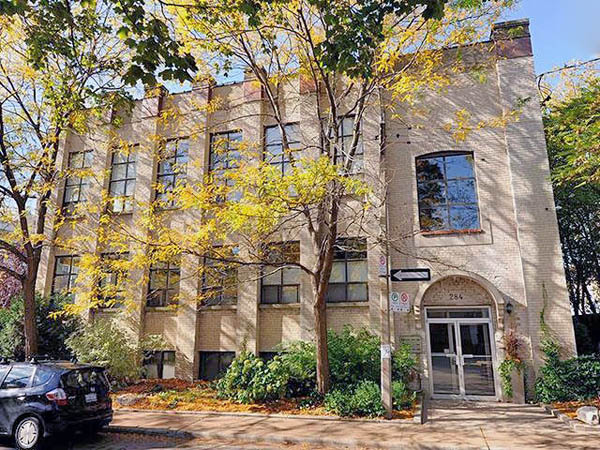 Sorauren Avenue is in the heart of a quiet, family neighbourhood, where people know their neighbours. Sorauren Park next door is a haven for dog walkers and kids – and it has one of the best farmers markets in the city. 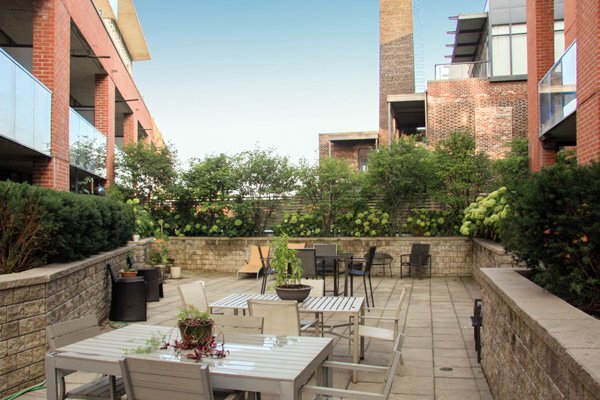 Authentic lofts with a healthy dollop of community and a large side of lifestyle is what the Robert Watson Lofts are serving up. 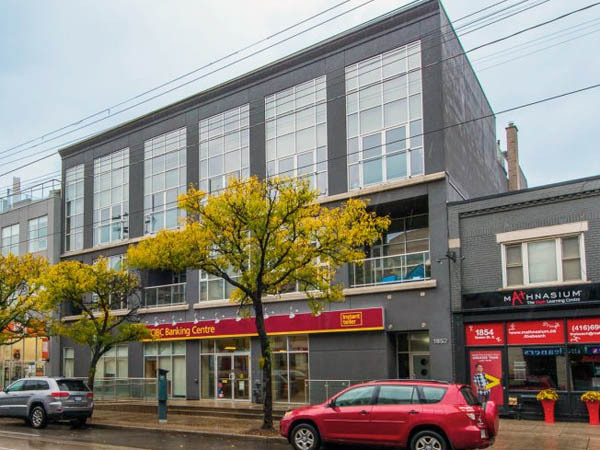 Roncesvalles is primarily a residential neighbourhood, one that has become increasingly in demand in recent years, especially since the city undertook a major reconstruction of the area from 2009-2011. 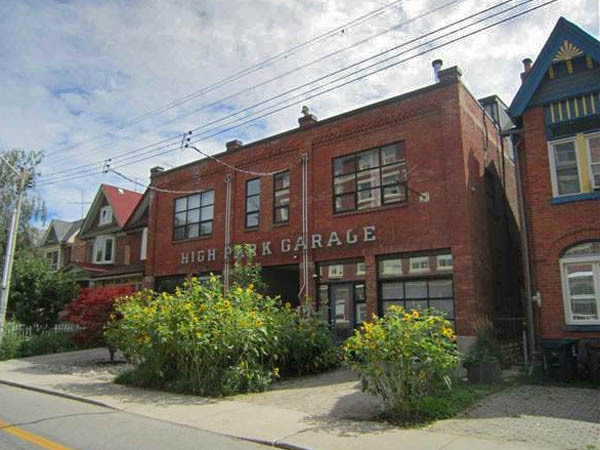 The renovations not only replaced much of the infrastructure, but also rebuilt sidewalks and bike lanes and beautified much of the neighbourhood with trees and planters — turning the area, especially Roncesvalles Avenue itself, into a pedestrian-friendly destination. 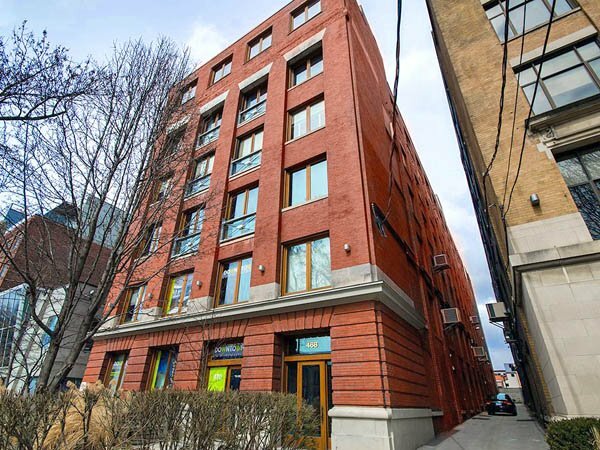 Current Robert Watson Loft Listings.